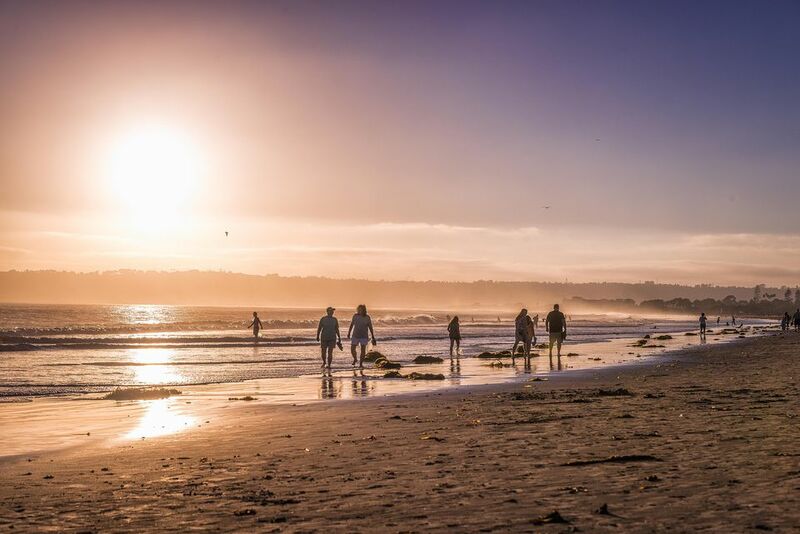 All of summer is a busy tourist time in a city with so many family-oriented attractions, but the crowds get even worse toward the end of the season when visitors from Phoenix and other hotter places head to San Diego to escape the heat. August is San Diego's best summer month—it's still warm with a low chance of rain, clear days, and little fog. Average highs for the month are around 77 degrees, and lows are about 67 degrees. Rainfall is a mere 0.02 inches (0.1 cm), and average humidity is about 70 percent. Water temperature is 68 degrees F (20 C). The sun shines 70 percent of the time, and you'll have about 13.5 hours of daylight. Pack a mid-weight jacket, especially for the evenings near the water. Bring short-sleeved shirts and lightweight pants for daytime, with a sweater for layering and shorts for the warmest days. If you plan to hit the beach, bring a swimsuit and sunscreen, but also bring a cover-up in case it starts to cool down. The city also offers some trails for hiking, so if that interests you, be sure to bring active clothing and appropriate footwear for that. Labor Day is the first Monday in September, but in some years, the three-day weekend begins in August. Use the guide to Labor Day Fun in California to get some ideas on what you can do in San Diego over the long weekend. Here are some other annual events to check out throughout the month of August. Del Mar Races: Thoroughbred horse racing has been happening here since 1937. If you attend a race, your admission price includes any of the weekend's concerts. San Diego Spirits Festival: All in the name, this festival is about craft cocktails, good food, and fun culture. Bike the Bay: This 25-mile bike ride is the only opportunity to ride over the Coronado Bay Bridge. At the finish line, you can celebrate with food, beer, and entertainment. World BodySurfing Championship: Held in Oceanside next to the pier, hundreds of the world's best bodysurfers come to compete for the title. CityFest: Held in early August, this yearly festival celebrates the community of Hillcrest, and it takes place in the heart of it with food, crafts, and entertainment. Humphreys by the Bay Concerts: Catch a show at this outdoor summer concert series held on Shelter Island from June through mid-October. Old Globe Theatre: Mid-June through late September, outdoor Shakespeare productions occur in a reproduction of the playwright's original Globe Theatre. Camp Out at the Safari Park: On Saturdays in July and August, the San Diego Zoo offers special overnight campouts at the safari park. Most are geared toward families, but one weekend is an all-adult version. San Diego Padres Baseball: The Padres' pretty downtown baseball stadium is a great place to watch a game. Watch Grunion Run: March through August is time for a uniquely Southern California event. During the annual grunion run, thousands of tiny, silvery fish mate by the light of the full moon (or the new one). (See the schedule.) The best San Diego beaches to see the show are La Jolla Shores, Pacific Beach between Tourmaline Park and Lifeguard Tower 20, Mission Beach between Lifeguard Towers 19 and 10, Ocean Beach between Mission Bay Channel and the Ocean Beach Pier, and on Coronado between the Hotel del Coronado and Dog Beach. Hotel occupancy is near the year’s highest levels in August. To avoid sellouts and high rates, reserve as far ahead as you can, making sure that there are no cancellation penalties if you change your mind. In August, beaches in San Diego are susceptible to so-called "red tides" when red-colored algae grow so fast that they "bloom," coloring the water in the process. It's unsightly for sure, and it's safer to avoid swimming while they're happening. Find out everything you need to know about red tides. If you're expecting unrelenting sunshine in San Diego in early August, you may be disappointed. Through the middle of the month, the coastline is sometimes gloomy, overcast and cool instead. San Diego's warm summers make it a great place for outdoor activities in the evening.